We provide water well services in Kingman and surrounding areas in Mohave and Yavapai counties in Arizona. Well Site Meeting - Once a decision has been made to drill a well, a well site meeting is held where the determination is made at the property location as to where the proposed water well will be installed. A wood stake will be hammered into the ground at this location to indicate the proposed well site. If the property parcel is less than five acres, measurements will be recorded to assist in the permit application process to properly reflect setbacks and distances from septic tanks and property lines. Permits - The next step involves obtaining the proper permits. Domestic wells on property parcels greater than 5 acres, as well as all commercial wells, only require a state permit from the Arizona Department of Water Resources and can be applied for online the same day. All other domestic wells to be drilled on property parcels less than five acres will require an additional permit from the Mohave County Health Department and the processing time for this permit may take as long as 4 weeks. These permits are valid for one year. Scheduling - Once the necessary permits have been issued, well construction will be scheduled. We try to schedule the drill rigs with other jobs in the area to help keep mobilization costs at a minimum, so it may be a few weeks before a drill rig will be available to drill at the property location. Drilling - The day drilling begins involves mobilization and setup of the equipment and crew. In addition to the drill rig, there will be a water truck, and a crew truck with a trailer. A lot of noise is made during the entire drilling process and ear protection should be worn at all times while near the drilling area. Once the driller has reached water in the hole, the drill rods are removed and replaced with casing appropriate based on the drilling conditions and the stability of the ground. 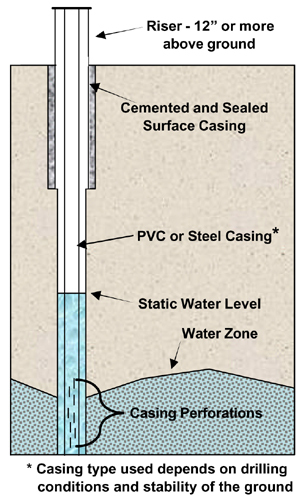 A cemented, steel-cased surface seal with a one-foot riser is left at the well site upon completion. Well Completion Report - Once the well has been drilled, a final well completion report is recorded and filed with the state and a copy is mailed to the well owner.